London, October 2009 - The extraordinary music from the legendary 60s psychedelic band, The Syn, has just become visual thanks to Peter Mcguiness, an independent film director from Sydney, Australia. The result is the remarkable 'New Reality' video made from a track off of the The Syn's new album, 'Big Sky' and now screening across the Web in 3 separate and unique versions. The inspiration for this project came about when Steve Nardelli, lead vocalist and writer of The Syn, met up with Peter Mcguiness on the All Good People music discussion forum. "We are always looking to collaborate with quality musicians, performance artists, composers and theatre companies to create unique music film," said Mcguiness. The synergy between Nardelli's song writing and Mcguiness' creative film making resulted in a signature Mcguiness music video. "Peter is a true independent of mind and it is evident in his productions. Working without the MTV gloss, Peter delivers well-crafted, thought-provoking and unique music films. With "New Reality," we have a visual interpretation presenting an important message related to the times we are living," said Nardelli. While THE SYN has their eyes firmly focused on the future of progressive rock, their roots go back to the 1960s. One of the precursors of prog rock and adorned with some of the most important musicians of the genre across its remarkable history, The Syn today are a band that operate intently in the modern day world, focused on pushing the envelope of modern progressive rock and moving it in new directions. Their Big Sky core lineup of Steve Nardelli, Francis Dunnery and Tom Brislin may have only been a musical machine since 2008, but this is a band with a long and storied history of constantly exploring new musical soundscapes. As a follow up to the successful Big Sky tour shows, The Syn is preparing the release of the live CD recording of their acclaimed performance at RosFest and a live video/documentary of their benefit shows and workshops at the Gloucester High School in Virginia. Peter Mcguiness has made a name for himself with his signature style of filmmaking. 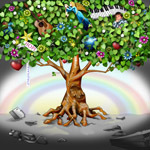 Taking his films to an expanding audience, Peter Mcguiness has developed a new music video channel at www.Pedro-tv.com. In association with reddot productions, pedroTV has been MAKING MUSIC VISUAL since 1975. Big Sky is available now on Umbrello Records and exclusively distributed by Alliance Entertainment. mood from the band…dark, suspenseful, and modern. 5 KINGS,CLOWNS,CARDINALS ...rootsy acoustic opening...again...suits Steve's husky voice...another FU song, "people comin' at me ,secret sarcasm"...basically he's saying he'll go his own sweet way....nice keys again from Brislin. Brilliant...takin swipe at web critics but maybe also at deeper authority figures...though it could be all a hall of mirrors/metaphors...nice electric piano…Dorie's sweet back vox...great track...again dreamy interlude till "shine on, shine on" section...great change of dynamics, mood...Dunnery, take a bow. Great production...horns, excellent drummin, bass...my lord, these rocks. angels, demons, kings, cardinals, milkmen. It's nice to see Steve write a song about a specific person, an ode as it were...very heartfelt, great melody...Noel Gallagher dreams about Liam being able to write such ballads for the last 3rd of OASIS albums...Steve should sub contract...."let the bells ring"...very English, very Sgt. Pepperish. lyrics..."there is a bigger sky"...time for renewal....incandescent lead guitar, squalling but not overlong, again folky acoustic, great shifting dynamics, "something’s gotta give" great shuffling section… "Like winds across the prairies, like smokin cigarettes"....time for action. this right now...very cool English melodic rock that only the blasted poms can do...it ain't fair. certain phrases throughout CD...uplifting messages/nice turn of phrase ("head full of scorpions"?---do we owe this to someone or is it original ? )...Steve has to be admired for his determination plus simple strong melodic songs, simple as that...if I can sing snatches of them as I work and commute and shop and stand at taxi ranks, anyone can....would love to see THE SYN on jools Holland and especially givin' it the full welly at the Canterbury Hurlstone Park RSL (Sydney) sometime soon. 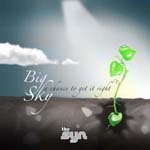 March 26th, 2009, New York – After nearly four years since their last major release, neo-progressive band The Syn are proud to present their brilliant new CD, Big Sky. Although the CD won’t be available in stores until late April, The Syn are currently offering the chance to download the CD now as part of a special pre-sale package from www.UmbrelloRecords.com. The offer includes both digital and CD versions of Big Sky along with a limited edition t-shirt. A second package also includes a discounted concert ticket for a venue of your choice on The Syn’s upcoming US tour. The Syn was formed in 1965 by Steve Nardelli and Yes bass player Chris Squire and has enjoyed a variety of line ups over the years, including contributions from Yes members Alan White and Peter Banks. Now The Syn are back with a fantastic new line-up featuring founder member Steve Nardelli on vocals, Francis Dunnery of It Bites and Robert Plant fame on guitars and vocals, keyboard whiz Tom Brislin (Spiraling, Yes), Paul Ramsey and Brett Kull (both of progressive rock band Echolyn) on drums and guitar respectively. Also prominently featured on the Big Sky CD is female vocalist Miss Dorie Jackson. At its core, Big Sky is a progressive offering in the truest sense of the word as it beckons the listener to reach out for a brighter future. Word by word, note by note and chord by chord, Big Sky, as its name foretells, constantly inspires as it builds in fantastic layers of rhyme, rhythm and melody on its soulful journey. The Syn fuse their legendary past with a musical painting of the future and by the end of the CD, we all stand together under the glow and promise of the Big Sky. The Syn's latest album offers a message of hope and a reminder that life is worth living. About Umbrello Records: Umbrello Records is a leading independent record label and part of Umbrello Music Entertainment. Umbrello Records is home to a diverse family of artists. In addition to progressive music leaders The Syn, the roster includes talented artists Julie Felix (in a collaboration with John Paul Jones of Led Zeppelin), K2 featuring Allan Holdsworth (U.K., Level 42), Ryo Okumoto (Spock’s Beard), Ken Jaquess (Atlantis), violinist Yvette Devereaux and drummer Doug Sanborn (The Untouchables). February 18, 2009, New York – Progressive rock band The Syn will show off a new lineup and a new vision with their latest CD Big Sky and an extensive North American tour that includes a performance at the world famous progressive rock festival in Philadelphia, RoSfest. Stops also include Baltimore’s famed Orion Sound Studios, Chicago, Milwaukee, New York and much more. The group will be also be doing two full evenings of fundraising performances in Virginia with all proceeds to be donated to music, education and the arts. Formed in 1965, The Syn was a precursor of the band Yes, with that band’s bassist Chris Squire as one of the founding members. At various times The Syn has also included Yes alums Peter Banks and Alan White in their lineup. Now The Syn continues forward with a core lineup of Steve Nardelli (founding member, songwriter, lead vocalist and guitarist), Francis Dunnery (of It Bites and Robert Plant fame – guitars and vocals) and Tom Brislin (Spiraling – also keyboardist on Yes’ Symphonic tour – keyboards and vocals). The lineup is augmented for the tour by Paul Ramsey (Echolyn) providing drums and other percussion and Brett Kull (also of Echolyn) on guitar. Much of the Big Sky tour will be filmed. The footage will be released as a documentary of the tour. This film will be available in both digital and physical formats. For more details you can find the Syn on the web (and get a full listing of tour dates) at myspace.com/thesyn. Peace Frogs, a leading US manufacturer of ecologically responsible, sustainable living, and green-themed clothing is sponsoring the tour. A jointly-designed authentic branded Syn merchandise line will be available for sale at all of The Syn's live performances and selected in-store appearances and promotions. February 24th, 2008 — As a founder of TheONETV and founding member of the band The Syn, Steve Nardelli has always shown himself to be a true innovator on many different levels. With the recording of the new Syn CD (Big Sky) Nardelli takes that spirit of innovation to a new plateau. The recording process of the album is going to be filmed and televised via IPTV broadcast and mobile telephones world-wide. Music fans will have an intimate, inside experience—a concept that is sure to take off so remember where it originated. Nardelli is the lead singer, songwriter and overall "main man" of The Syn. In the past, The Syn has included Yes members Chris Squire, Pete Banks and Alan White in its ranks, and currently boasts a lineup that is every bit as impressive. Nardelli is joined by Francis Dunnery on guitar and vocals and Tom Brislin on keys and vocals. Dunnery is probably best known for his work in the legendary band It Bites and for his great solo work. He also played in Robert Plant's band (the Led Zeppelin connection continues with Umbrello Records featuring John Paul Jones on their up- coming Julie Felix release). Tom Brislin was the very talented keyboardist for Yes on their symphonic tour and not only has worked with Meatloaf and Debbie Harry but also has his own band called Spiraling, which has developed quite a following. The Syn will also be joined on the new album by a number of very notable guest performers. Click here to read the SYN Press archives.